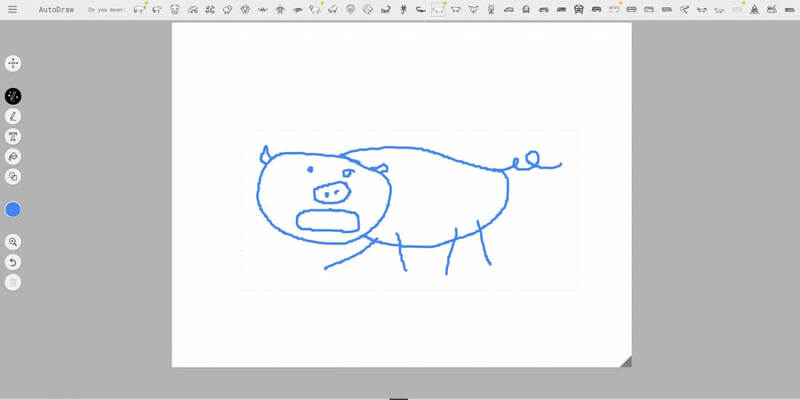 If, like me, you have the drawing ability of a household pet, Google’s web-based AutoDraw tool could be your savior. Essentially, it analyzes a doodle in real time and suggests some similar, but professional looking, alternatives. The free program is part of Google’s A.I. Experiments series. Thanks to machine learning and image recognition tech, users can draw a basic object and it will (hopefully) decipher the picture, offering a number of more recognizable drawings from its database. The underlying technology comes from Google’s ‘Quick, Draw!’ game released last year, which involves a neural net trying to guess what a player is drawing. The more people play, the more accurate it becomes. AutoDraw.com works on desktop and mobile devices. During the time I spent with it, the program managed to recognize my most seemingly indecipherable scribblings. Even the attempted pig that resembled something from a horror movie was correctly identified, and I was offered a series of alternatives that weren’t so nightmare-inducing. In addition to being a time-wasting distraction, AutoDraw can benefit anyone looking to create the likes of party flyers, invites, etc. It allows users to design a project quickly and not have to worry about their subpar drawing skills. Once you’ve finished your masterpiece, it can be downloaded or shared on various social media channels. The images in AutoDraw’s database come from different artists, designers, and illustrators. If you’re someone who happens to have excessive artistic talent, you can donate your work to the project here. Looks like they simply pull down the nearest image to what you are drawing so I don't see it being all that "special" .... what did I miss? Can somebody draw me a picture of that??? You missed the steps to search for that perfect image you need, then hopefully you get it as a PNG with invisible background, then hopefully it's on a size you want or need, then hopefully you have enough paint -mad- zkillz to actually make it look good. So it's a lot of hoping, they made a task that is not complex -at all I know- but does require time, into an effortless almost instant one, for anyone with or without any computer-savvy-ness (For free). grumpiman and Reehahs like this. If it's just selecting from a preset group of what is basically clipart I would almost think it's faster to just have a search bar. I can type "bicycle" faster than I can draw one. lazer, Reehahs and andrewdoyle88 like this. Don't forget to add the word "drawing" in your search or it can become a hell of a search for a simple image you want. WOW! I had the same exact thought! I watched the video and the first thing in my mind was - "This is next gen clipart"